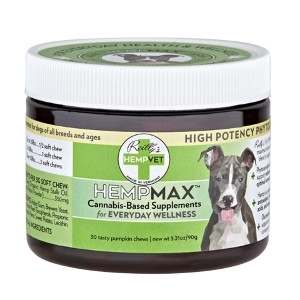 HEMPMAX soft chews purely contain our highest potency of organic phytocannabinoid-rich hemp blend, naturally supporting canine cellular health, while helping maintain good mood, immune response and contributing to the overall balance of the endocannabinoid system (ECS). 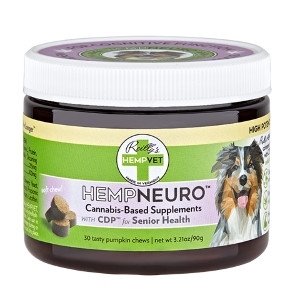 HEMPNEURO soft chews combine our nutritional, organic phytocannabinoid-rich hemp blend with proprietary Colostrum Derived Protein™ to support neurological health and neurocognitive function with focus & clarity, while contributing to the overall balance and harmony of the endocannabinoid system (ECS). Recommended for training larger puppies as well as to promote long-term brain health in senior dogs. 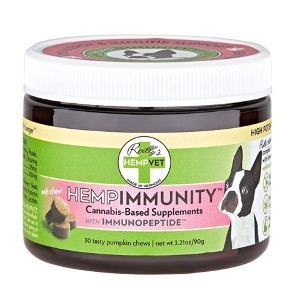 HEMPIMMUNE soft chews combine our nutritional, organic phytocannabinoid-rich hemp blend with proprietary Immunopeptide™ to support immune system health, resistance to pathogens and free radicals, and defense against occasional or seasonal allergies, while contributing to the overall balance and harmony of the endocannabinoid system (ECS). 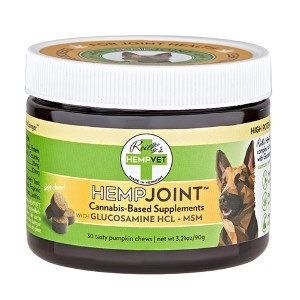 HEMPJOINT soft chews combine our organic phytocannabinoid-rich hemp blend with Glucosamine HCL + MSM for the ultimate joint mobility support, flexibility, and physical comfort in dogs of all ages, especially those needing extra care, such as working, sport or senior dogs, while also contributing to the overall balance and harmony of the endocannabinoid system (ECS). 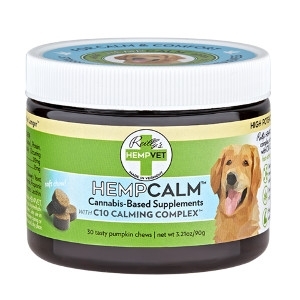 HEMPCALM high potency soft chews combine our organic phytocannabinoid-rich hemp blend with proprietary C10 Calming Colostrum Complex™ to support fast-acting calm, relaxation and general wellness in pets experiencing anxiety, stress or nervousness, while contributing to the overall balance and harmony of the endocannabinoid system (ECS). Recommended for larger dogs and/or those needing extra support. 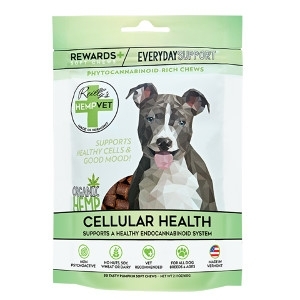 Rewards+ Everyday Support soft chews, with increased levels of our nutritional, organic phytocannabinoid-rich hemp blend naturally support canine cellular health, while helping maintain good mood, immune response and contributing to the overall balance of the endocannabinoid system (ECS). 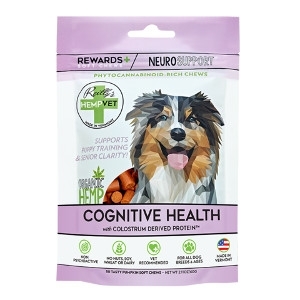 Neuro Support Rewards+ soft chews combine our nutritional, organic phytocannabinoid-rich hemp blend with proprietary Colostrum Derived Protein™ to support neurological health and neurocognitive function with focus & clarity, while contributing to the overall balance and harmony of the endocannabinoid system (ECS). Recommended for training puppies as well as to promote long-term brain health in senior dogs. 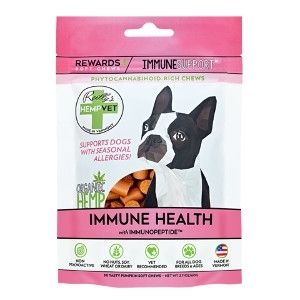 Rewards+ Immune Support soft chews combine our nutritional, organic phytocannabinoid-rich hemp blend with proprietary Immunopeptide™ to support immune system health, resistance to pathogens and free radicals, and defense against occasional or seasonal allergies, while contributing to the overall balance and harmony of the endocannabinoid system (ECS). 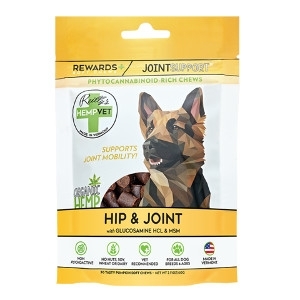 Joint Support Rewards+ soft chews combine our organic phytocannabinoid-rich hemp blend with Glucosamine HCL + MSM for the ultimate joint mobility support, flexibility, and physical comfort in dogs of all ages, while also contributing to the overall balance and harmony of the endocannabinoid system (ECS). 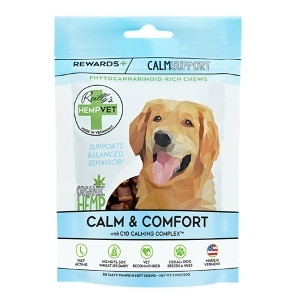 Rewards+ Calm Support soft chews combine our organic phytocannabinoid-rich hemp blend with proprietary C10 Calming Colostrum Complex™ to support fast-acting calm, relaxation and general wellness in pets experiencing anxiety, stress or nervousness, while contributing to the overall balance and harmony of the endocannabinoid system (ECS).